Hi everyone! Here’s to a new month! And that means a new challenge here at a2z Scrapbooking Blog! Our challenge this month is “It’s a Love Thing” and we’d love to see your love-themed project using primarily RED and/or PINK! As you know, we’ve changed our rules a bit and participants are no longer required to use Hero Arts products to enter our challenges. 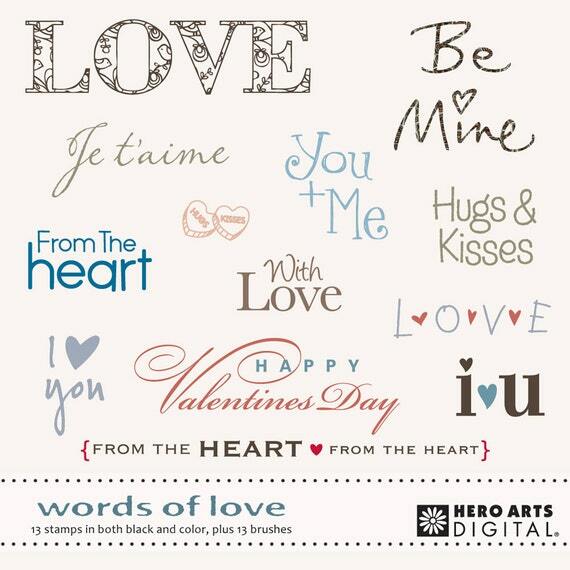 Each month we feature a ‘Digi of the Month’ which will be the prize offered to our randomly-chosen challenge winner, and this month it is Hero Arts Words of Love! And to sweeten the pot, if you are the randomly-chosen winner and you have used Hero Arts products on your project, you’ll ALSO win a $20 gift certificate to the store! The Winner and Top 3 will be announced on the 7th of this month! Thanks so much for stopping by! We can’t wait to see what you create! Categories: Challenges, Handmade Cards, Hero Arts | Tags: Its a Love Thing | Permalink. Fun challenge indeed. Beautiful projects ladies! Love the inspiration from the team.